0.7-1.2 (2.5) cm broad. Nearly hemispheric to convex, expanding to broadly convex with age. Margin translucent-striate when moist and often appendiculate at first, with minute fibrillose remnants of the partial veil. Reddish cinnamon brown to dark brown. Surface moist when wet, soon dry; smooth overall to slightly wrinkled towards the disc with age. Margin translucent-striate when moist to slightly wrinkled towards the disc. Cap is hygrophanous and lightens to a tan color when exposed to dry conditions. Attachment adnate and close, and moderately broad. Colored cinnamon brown with whitish edges near the margin, darkening in age. 20-40 mm long by 1-1.4 mm thick. Equal to slightly curved at the base, fragile, easily breaking. Whitish at first, becoming grayish or brownish at the apex, and often adorned with whitish mycelium at the base that bruise bluish. Partial veil thinly cortinate, sometimes leaving trace remnants along the cap margin, soon disappearing. No annulus formed. Spores rusty brown in deposit, 6.5-9.0 x 4.3%u20136.0 um; Ls = 7.8 - 0.72 um, B = 4.9 - 0.43 um; Q = 1.4%u20131.8, av. Q = 1,58 - 0.1, n = 40; broadly elliptic in face-view, slightly flattened on one side in side-view, fairly thin-walled, pale brown in water, rust-orange in alkali, germpore small but distinct. Basidia 4-spored, 14%u201319 x 7.0%u20138.5 um, clavate. Cheilocystidia 19%u201331 x 7%u201316 um, lageniform, drawn out into a neck up to 15 %u03BCm long from swollen base, with obtuse or subcapitate apex 3.5%u20136 um broad. Pleurocystidia absent. Pileipellis a hymeniform layer of sphaeropedunculate cells 12%u201326 um broad. Stipitipellis of hyaline, parallel, filamentous hyphae covered with clusters of caulocystidia. Caulocystidia 24%u201352 x 12%u201319 um, lageniform, drawn out into a short neck from swollen base, with obtuse or subcapitate apex 5%u20137 um broad. Veil not observed. Clamp-connections not observed. This mushroom likes growing in areas that have been well manacured and taken care of, you notice them growing thier unusually white stem in grassy areas such as parks and lawns. Reported from Washington, Colorado, Vancouver, B.C., and temperate regions of central and northern Europe. Singularly or few in numbers in the surrounding area or in clusters. Bruising at the bulbous base, sometimes immediately after it has been plucked from the substrate. 40-50 small specimens, 1/3 of a fresh ounce and/or 1 dried gram. Also described as Conocybe cyanopus. A taxonomical choice has been chosen here to include this species and Ph. 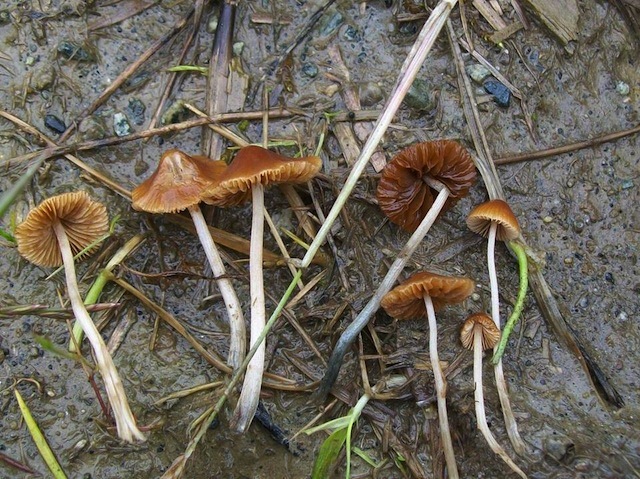 smithii in Pholiotina instead of Conocybe. The micro features on the pileus is what is called a hymenoderm pileipellis, which has been used to separate other species from the genus Conocybe to Pholiotina. Pholiotina cyanopus can be a difficult species to identify for begginers as it can get confused with other LBM's quite easily. Potently active, although petite in size. Beug and Bigwood (1982b) found 0.93 psilocybin but no psilocin. Christiansen et al. (1984) reported ranges of 0.33-0.55 psilocybin and 0.004-0.007 psilocin. Gartz (1992) found 0.78-1.01silocybin, no psilocin, and 0.12-0.20 baeocystin. This species is probably widely distributed across the temperate regions of the world but goes unnoticed because of its minute stature. Looks a lot like Pholiotina smithii but differs microscopically in spore size and cystidia.